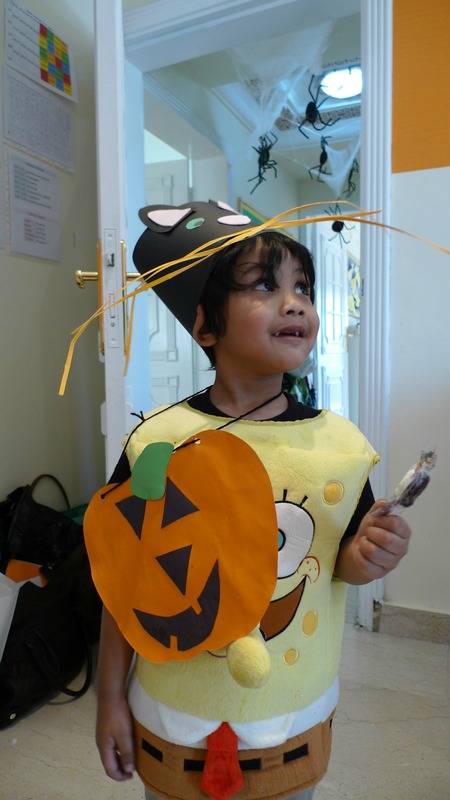 Today is Haqeem’s first Halloween Party. 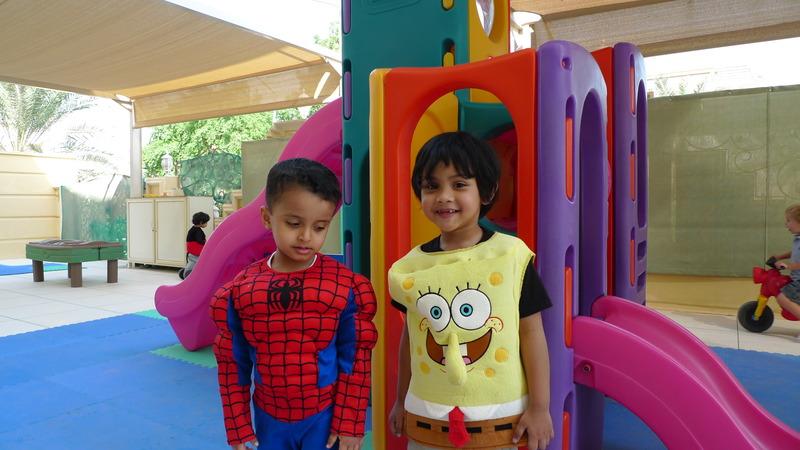 When I first got to know about the party, I was quite worried because knowing Haqeem, he definitely does not want to wear scary costume, but I was glad to know that the costume doesn’t have to be a scary one. So, last weekend we went to True Value to find Haqeem’s costume and lucky me… they are having SALE at the moment… not that the costume cost that much but KD7 is a bit too much to spend just for a costume that you gonna wear once. 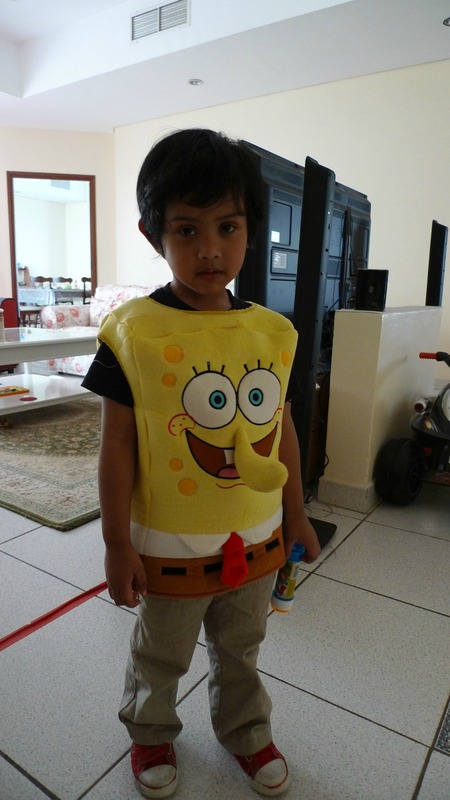 So, after searching for some time, we settled for Sponge Bob simply because it is the easiest to pakai and tak de banyak gadgets he he he…. anyway it is also one of his favourite characters. 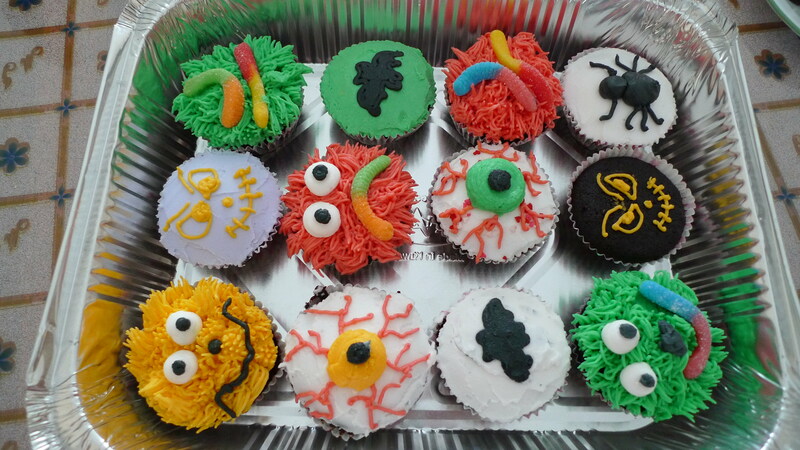 I baked some cupcakes for him to bring to the party. The clock shows 16:10 and believe it or not, I have not sat down since this morning….. really exhausted. Sunday is the busiest day of the week… biasalah, after weekend kenalah buat all the washing, cleaning, vacuuming, mopping and 1001 other things. Letih2 ni mulalah nak marah orang he he he but kena banyak2 bersabar as what my friend who is in the same boat as me said ” Sabar…. doing all the housework and taking care of kids banyak pahala!” That is right provided you tak membebel and marah2 all the time, instead of dapat banyak pahala, dapat dosa pulak he he he. Okaylah, lets talk about this sushi pulak. I made this sushi this morning after whole week of listening to my daughter blabbering about her friend bringing sausage sushi to school. 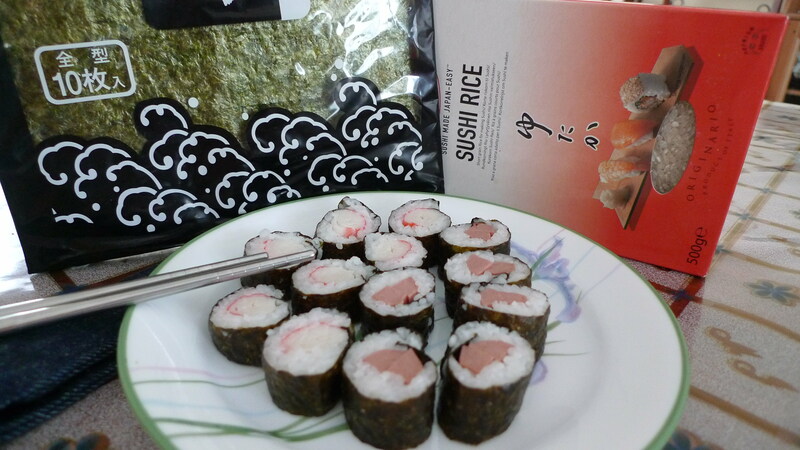 So, last weekend I went and bought sushi rice and seaweed. Here is the recipe just in case anyone wants to make it. Cook the sushi rice as per instruction on the packaging. Once cook and cool at room temperature, flavour the rice with vinegar and sugar. Place seaweed sheets on large plates and place 1 to 2 tablespoons of rice on each sheet. 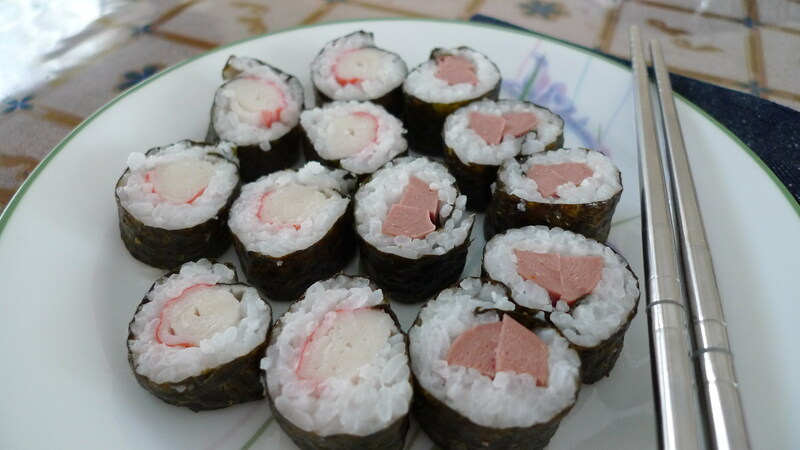 Place one thin strip of wasabi and one strip of sausage or any filling of your choice in the center; roll to form sushi. Slice using a sharp knife. Serve. 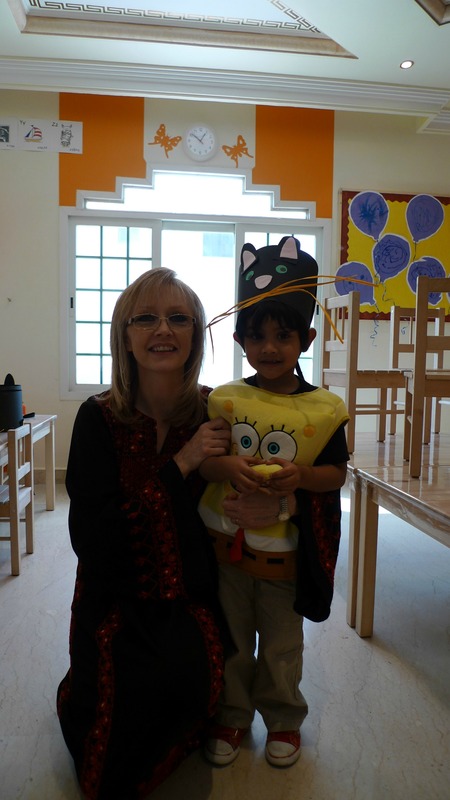 For me… لا شيء جديد , just the normal housewife stuff except that this morning I went to my Arabic class …. today we learned few new words and revised few sentences from last Monday. Want to know what I learned last Monday? OK here are few sentences / answers that were taught…. Well…. may be for some this is super duper kids stuff but as for a beginner like me, this is good enough…. Tu la dulu masa sekolah tak nak belajar Arabic betul2, now ni kena belajar balik he he he. Okay…. 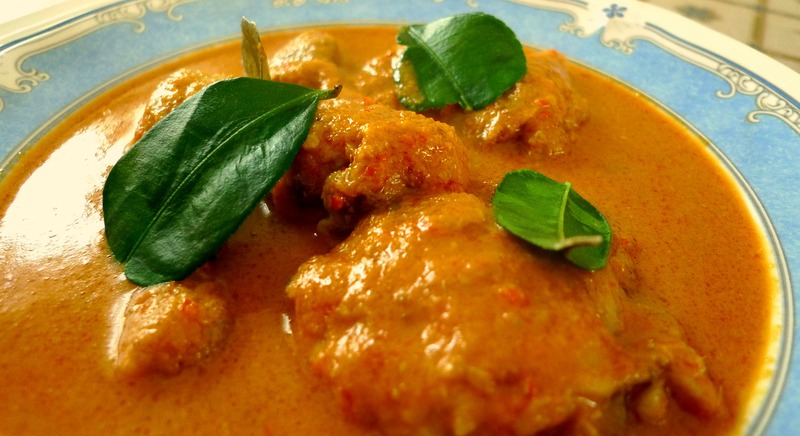 back to the recipe that I want to share today… Gulai Ayam Padang. Where did I get the recipe from? Well…I’m pretty sure that I took this recipe from Dapur Tanpa Sempadan – Mat Gebu, unfortunately I seems to be unable to search for it… strange… but if you must know, this is not my first time not being able to trace back the internet recipes that I have in my possession… mmm…well, at least I tried to give credit where it’s due, right? 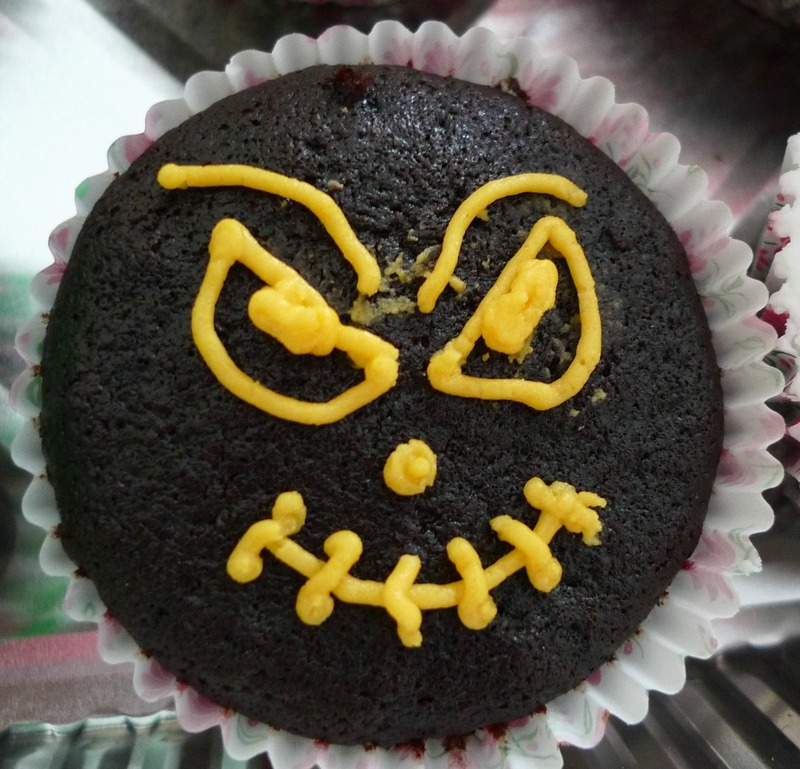 Anyway, being using this recipe for almost 2 years already and my kids love it. Thanks to whoever that shared this recipe on the net. Lets checkout the ingredient shall we! In a blender combine all ingredients marked ** till become smooth paste. Heat up oil in a wok and sauté the paste together with Kaffir leaves until fragrant and cooked. Add water and cook till the liquid reduced significantly and then add coconut milk, chicken, salt, sugar and lemon juice. Stir occasionally until the chicken cooked. If the gravy is too thick, add a little bit of water. Enjoy! Assalamualaikum…. it has been quite awhile since my last posting. 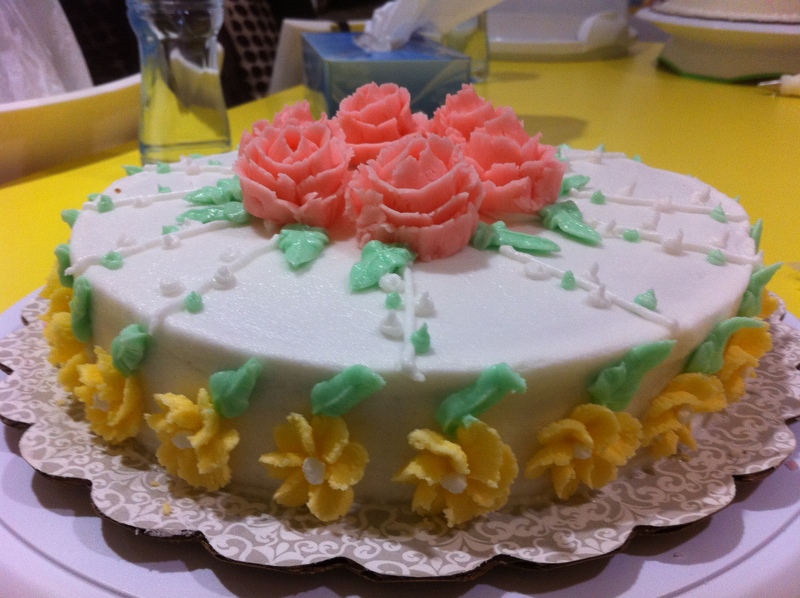 I have been quite busy for the last 2 weeks with my Arabic and Basic Cake Decorating class…. this week baru boleh bernafas sikit. 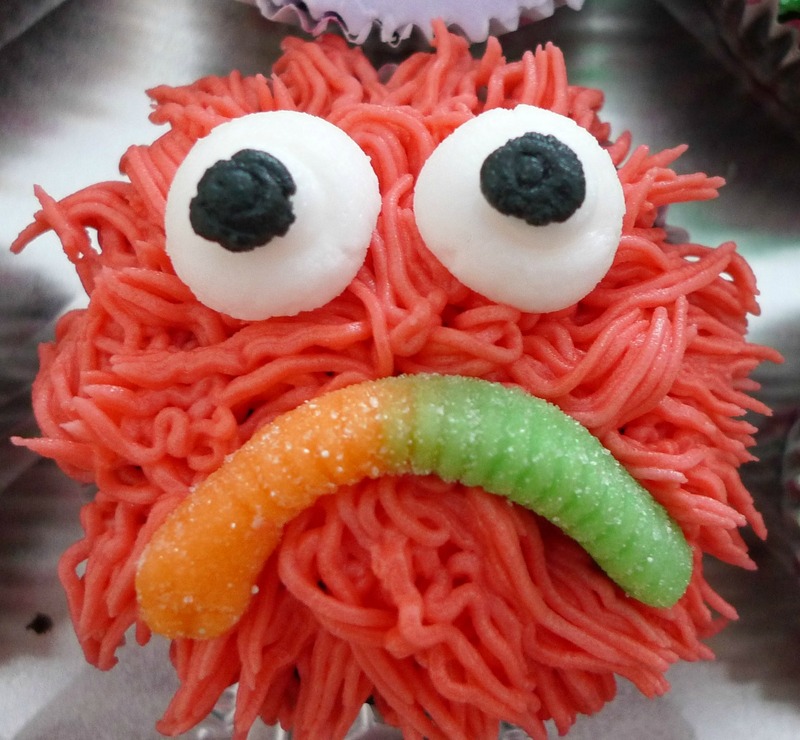 My Basic Cake decorating class was in Shuwaikh which is not that far but due to traffic, I have to leave my house an hour before the class and coming back was even worst. The class was 3 hours solid and by the time I’m back I’m too tired to do anything…. worst still, have homework to do. Having said all that, I’m glad that I did something for myself for a change. All I have to do now is practice practice and practice before I enroll for Level 2…. ada hati lagi tu nak gi kelas he he he. 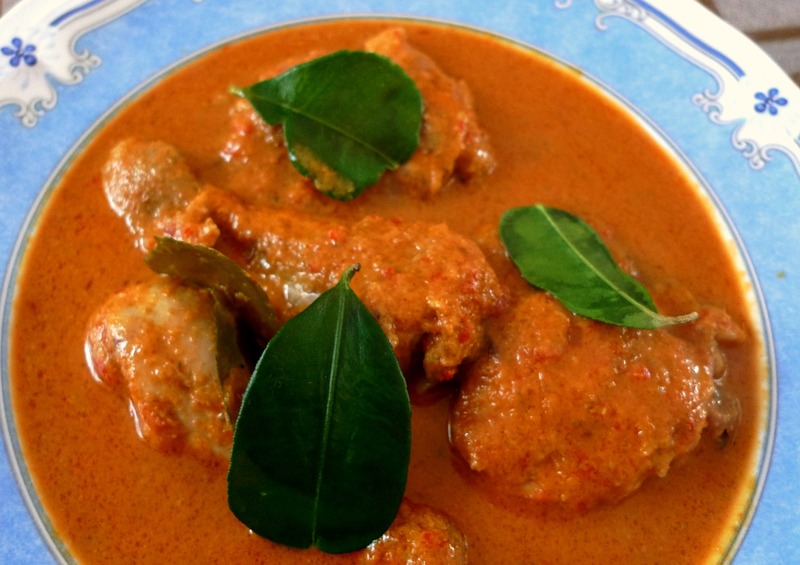 Anyway, to start balik blogging ni, kena lah slow and steady….. so easy recipe first OK. 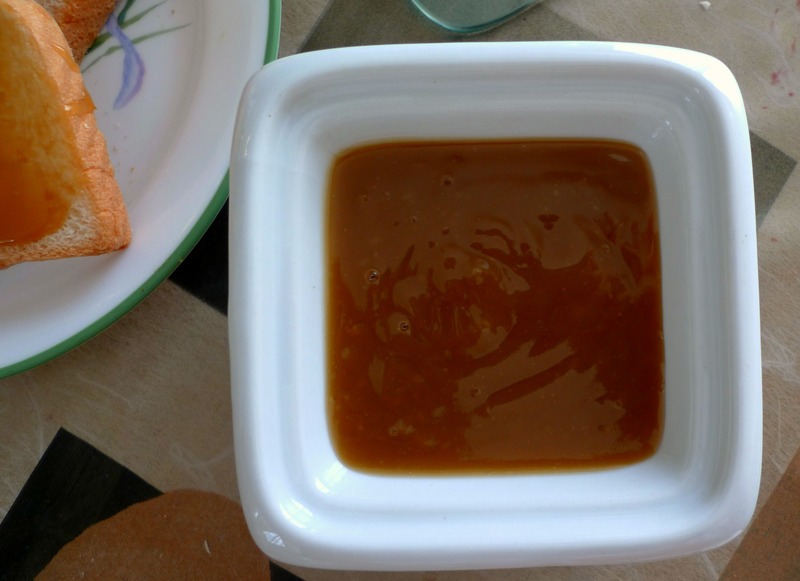 This kaya – coconut jam recipe was taken from this blog. I like the taste and I would say, similar enough to kaya taste that we are custom to. Lets see the ingredients! In a large bowl, whisk the coconut milk, eggs, sugar, and flour until well combine. Strain the coconut milk mixture into a double boiler or any heat resistant bowl that rests snugly on one of your saucepans, leaving about 3 inches of between the bottom of the bowl and the bottom of the pan. Heat the water to a gentle simmer and add the Demerara sugar into the strained coconut mixture. Stirring constantly but gently with a heatproof rubber spatula or a wooden spoon for about 20 minutes and put in the pandan leaves. 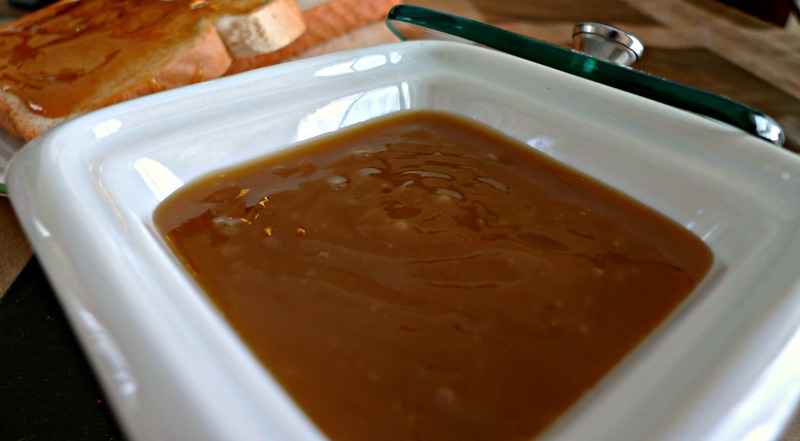 Continue to stir for about 30 to 35 minutes or until the mixture is thickened and with a spreadable consistency. Remove immediately, discard pandan leaves, and let cool before storing into a clean airtight jar. 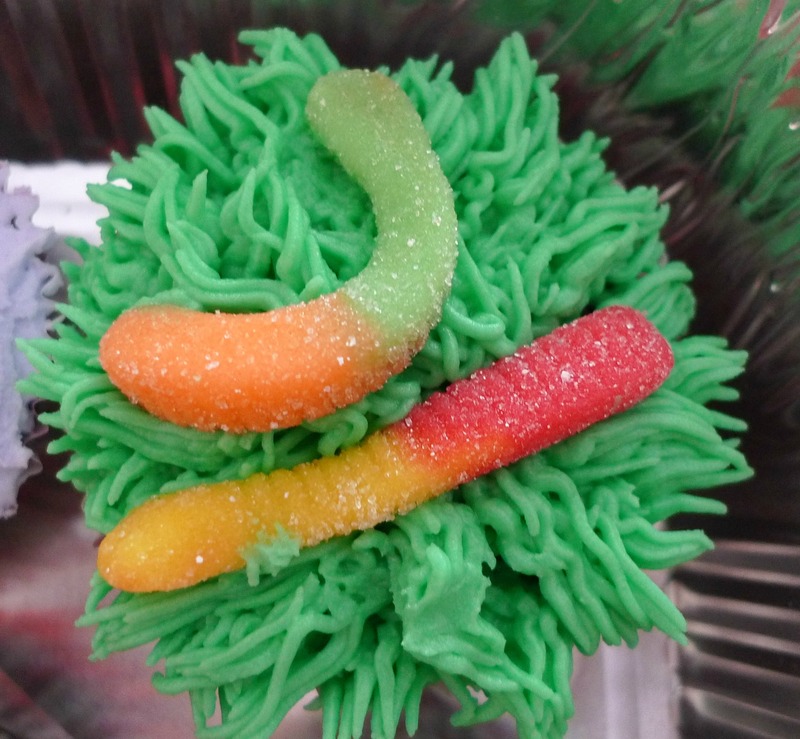 Result from 2nd class.. Cupcake on a cake. 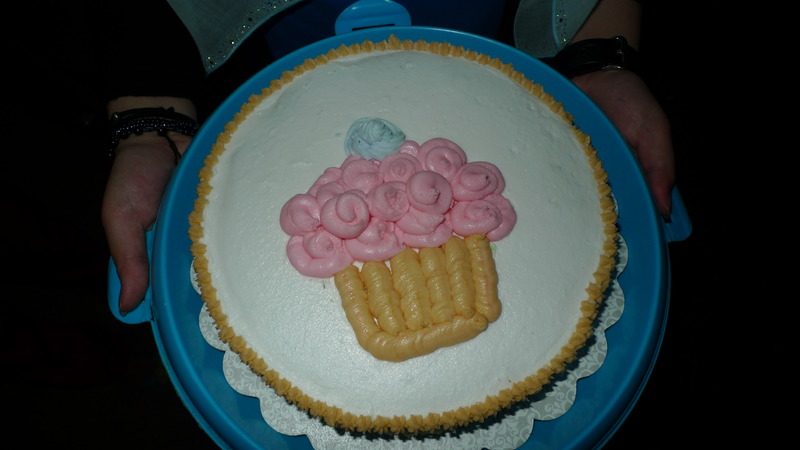 My cake fully decorated on the last class. مرحبا everyone… how are you guys? Hopefully life treats you well. For all the mums out here that their children are sitting for PMR, I wish them all best of luck. Breathe mum breathe… insyaallah everything will be fine. At moments like this, mums are likely to lose sleeps more than the children… why??? Well, it is simple…we care about them more than they care about themselves and we hope that they will do better than us in life insyaallah. Last Monday, my friend (Aza) and I went to Introductory Arabic class at AWARE center .. well, it is kind of too basic for us coz they were teaching the Arabic alphabet and we kinda know that already… but the problem is some of the things that they are going to teach are new to us. Level 1 Arabic pulak expect student to be able to speak some arabic and the class will be fully conducted in Arabic…. which means we wont be able to understand anything…so, what shall we do???? Dilema betul he he he. 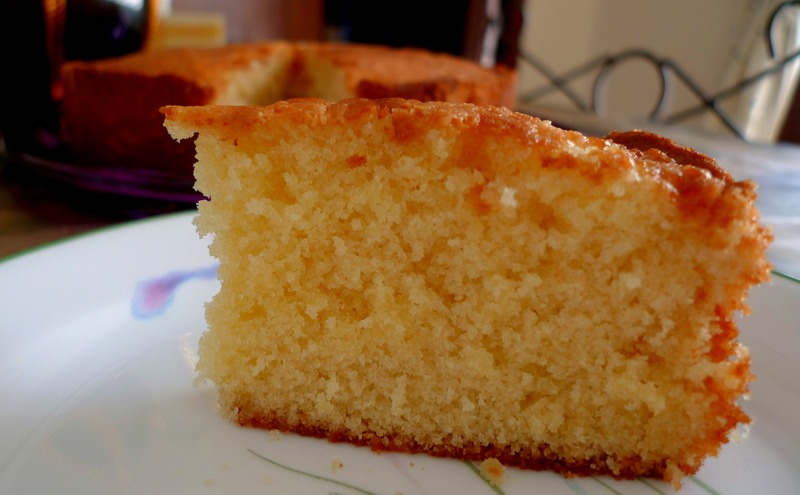 Anyway… recipe that I want to share today is butter cake. 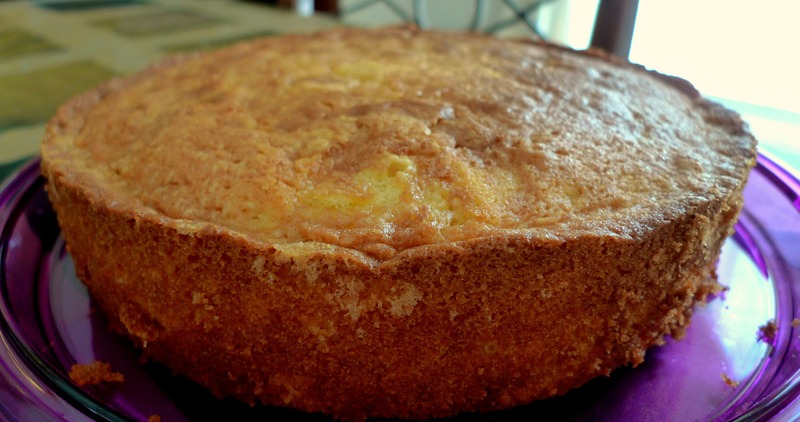 Nurin has been requesting for a butter cake since last Eid, it is not that I do not want to bake her one, it is just that I have not found a good recipe to try. Last night I finally found a reliable recipe to try. 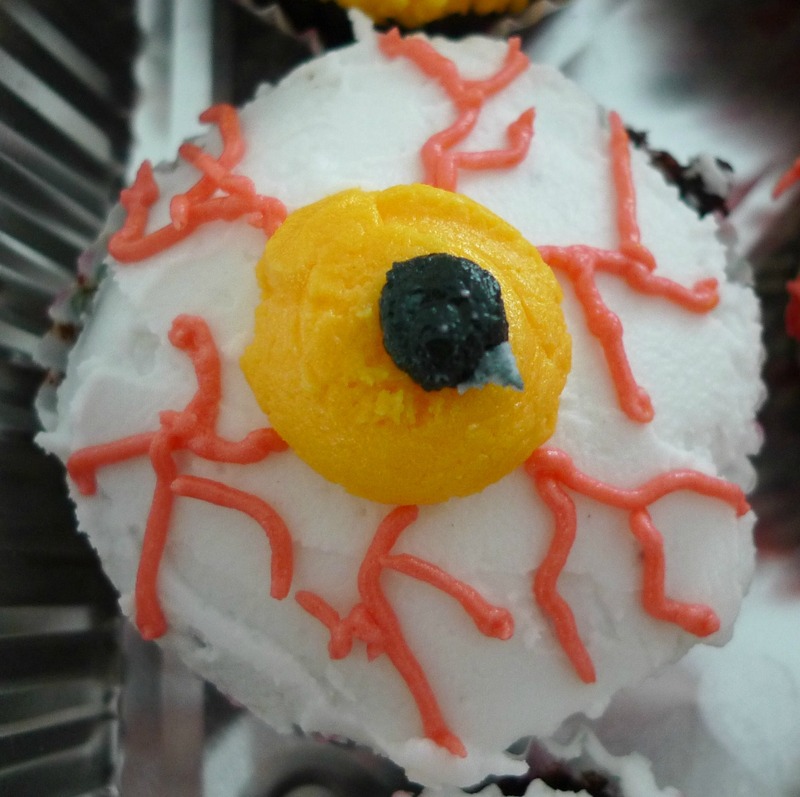 Thanks to Rima for posting this recipe. 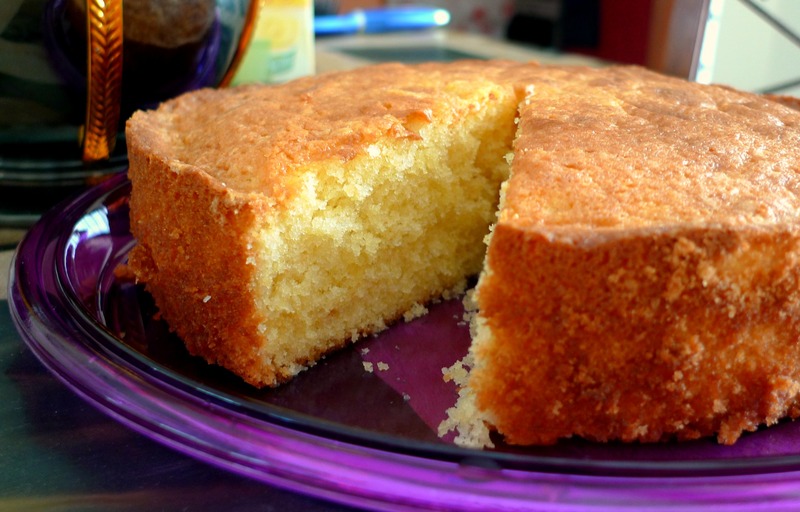 This cake is soft, moist and delicious…. worth waiting for he he he. Here is the ingredient. Preheat oven to 190C. Butter and line a 9-inch cake pan. Bake for about 40 minutes, or until it a skewer comes out clean.